During the past fiscal year, ITS has implemented various technologies at South Building that have greatly benefited users and deeply impressed others who visit the building. The ITS team serving the South Building is made up of Mark Wampole, Leslie Kreizman and Jim Moravansky. The technological advances began with digital signage, focusing on visitor information. The project resulted in two 70-inch displays on the first floor rotunda, one 42-inch display on the first floor stairwell, and one 42-inch display at the garden level entrance. Most of these monitors display building directories with scrolling pictures from across campus. In case of an emergency, all systems link to the Alert Carolina system. The “vision” display showcases that story and doubles as a warm and friendly greeting to the Carolina community and visitors to South Building. When Bob Blouin prepared to transition from Dean of the Pharmacy School to his current position as Executive Vice Chancellor and Provost, he requested an in-office conference room to be set up in South Building. His office was renovated into a multi-use room, equipped with an eight-person conference table, a new desk, a custom built-in cabinet for his new NewLine X7 touchscreen display, and additional technologies. His new state-of-the-art space was fitted with an AMX touch panel, which was installed on the table to control the X7 display, cable TV, two wired laptop connections, the Zoom Room, the WePresent wireless connectivity device, and a small conference room IP phone to provide for fully functional conference room capabilities. 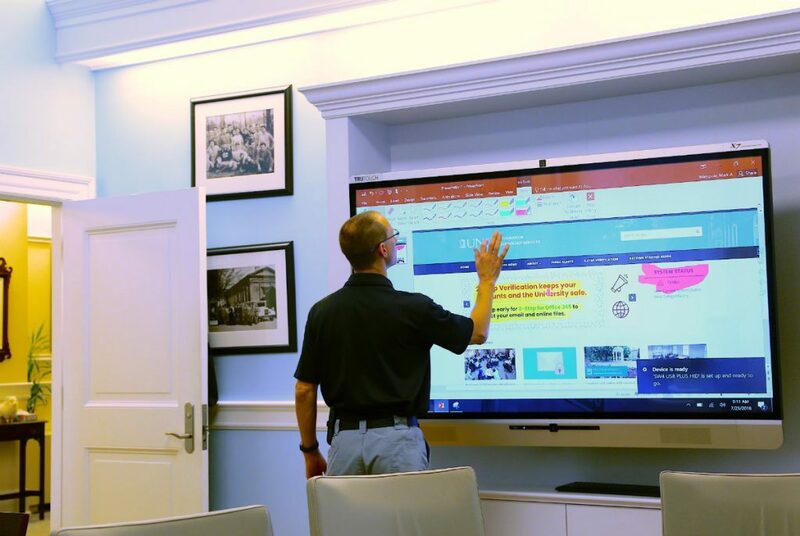 “The remodeling of the Provost’s Office has significantly transformed our ability to engage in impactful work by facilitating live group discussions augmented by contemporary technologies,” Blouin said. These newly renovated spaces are highly utilized and seen by many across campus and beyond, spurring many questions about the technology. As a result of these upgrades to South Building, several other units that the ITS team supports have upgraded, or are in the process of upgrading, their conference rooms. These include the University Counsel’s Office, which now has an X7 setup and has Zoom/Zoom Room capabilities, and the Faculty Governance Office, which went from one to three monitors, and has Zoom/Zoom Room capabilities. 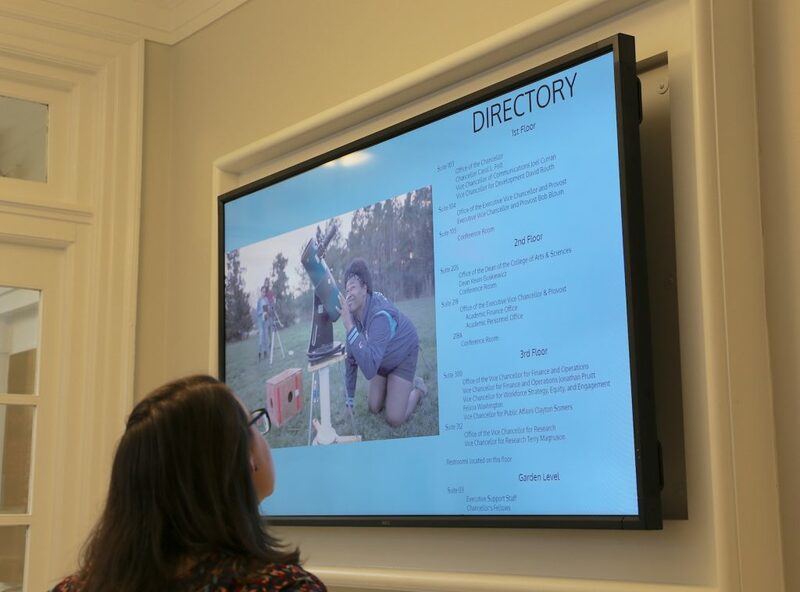 In addition, numerous other campus offices have gone to the ITS team for guidance on how to set up digital signage for their units. The team has discussed hardware (monitors, mounting hardware, wiring, etc.) and software (Risevision.com) with several units, including the Office of the Vice Chancellor for Research, the Office of the Vice Chancellor for Communications, and the Economics Department. “Leslie Kreizman, Jim Moravansky and I look forward to bringing new, innovative technology to South Building, as well as our other customers, in the coming year and continuing to inspire widespread usage of these improvements,” said Wampole, Tech Support Specialist within Managed IT Services – University Administration, a unit of ITS User Support & Engagement.